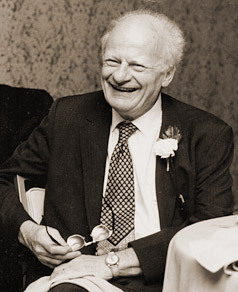 Professor Bethe delivered the three lectures on quantum theory in 1999 to his neighbors at the Kendal of Ithaca retirement community. This web site was produced at Cornell University in 2004 as a collaboration between the individuals listed below. The footage was taped by Cornell Information Technologies (CIT) Distributed Learning Services. Michael Allmendinger was producer/director; Edward Hershey of Cornell Communication and Marketing Services, executive producer; and Dale Corson, technical advisor. CIT Distributed Learning Services produced the site. Project coordination was provided by Mike Tolomeo and Diane Kubarek. Jeff Katris designed and created the site (with the Web Production Group), and as a Cornell physics graduate who greatly admires Professor Bethe, led content development. Jamie Kalousdian prepared the videos for web distribution. Cornell President Emeritus Dale R. Corson graciously served as personal representative of Professor Bethe during the creation of this web site -- especially with respect to content review. Dr. Dan Boye, Chair, Physics Department, Davidson College, provided an additional content review of the presentation. Published by the Internet-First University Press (IFUP). This video is among the initial offerings of the IFUP, published as part of a new, open-access approach to scholarly publishing. This online version is provided for personal use, without access fee. All mass reproduction, even for educational or not-for-profit use, requires permission; contact dcaps@cornell.edu. All of Internet-First University Press offerings can be found at https://ecommons.cornell.edu/handle/1813/62.